Bit not understand why new 5.44 for nanoPC T3 plus not run. I see only first boot screen and then black always ??? not understand why new 5.44 for nanoPC T3 plus not run. SUITABLE FOR TESTING (WIP) are devices which we’re currently working on but they are not ready! These images are suitable for developers and experienced users. They are not very well tested but they might work without any problems. Your help to improve this situation is greatly appreciated. Are you holding a boot key? Images should work. I'll check them again when I am back to the office. I upload new images, tested today. Except for those few noted issues, board performs nice. I tried run 39 ver. for M3 and it works. But all versions for T3plus wont work. ??? After u-boot screen always black screen with blinking cursor. Please drop URL to the image which you tried? I work with T3+ board. So, on T3plus board image for M3 ver 39 run. on T3plus board image for T3+ not run. That is strange. I am highly confident that both found here: https://www.armbian.com/nanopc-t3-plus/ has been tested. I can test them again later in the evening. Currently out of office. Can you make a PCB photo and/or get revision number. what changes between 39 ver. and 40? That is normal. How long did you wait until declare it doesn't work. It takes 17s from power on until I get a login prompt (Sandisk Ultra Class 10/average SD card). I agree that we should set some verbose output by default but hey, Rome was not built in a day. Just not understood why img. for M3 work and for T3+ not ??? I used same SD card. For T3+ resizing partition not happened. They have different bootloader bl1 and adjusted u-boot to support 2G memory. If you don't have 2G of memory or memory has some different configuration, which is extremely unlikely, than this can make troubles. The rest is the same. I know that T3+ image doesn't boot on 1G boards (M3 for example). Your board looks the same, but I did a picture to double check. CPU Wakeup done! WFI is expected. [  OK  ] Started Set the console keyboard layout. [  OK  ] Started Set console font and keymap. [  OK  ] Found device /dev/ttySAC0. [  OK  ] Started Armbian enhanced Log2Ram. [  OK  ] Started Entropy daemon using the HAVEGE algorithm. [  OK  ] Started Initializes zram swaping. [  OK  ] Started Resets System Activity Data Collector. [  OK  ] Started Save/Restore Sound Card State. [  OK  ] Started LSB: Set sysfs variables from /etc/sysfs.conf. [  OK  ] Started Dispatcher daemon for systemd-networkd. [  OK  ] Started Set console scheme. [  OK  ] Started LSB: Armbian gathering hardware information. [  OK  ] Started Network Manager Wait Online. [  OK  ] Started Serial Getty on ttySAC0. ok, I will try to catch something on serial at Monday. OK and check PCB. I've moved related posts to a separate thread. FriendlyArm img. 2GB RAM 32bit work OK. So 2GB !!! It is log from UART for different img. I think problems in new bootloader, because all other imgs. work OK.
Or maybe I have trouble with MPU? In this case, why do all the other images work? Hi Igor, can you give me answer about my case? If you need more info I am ready give to you. Last time I tried run with 3A PSU. Situation not change. I have downloaded 5.59 Nanopi T3 plus Ubuntu bionic, kernel 4.14.69. 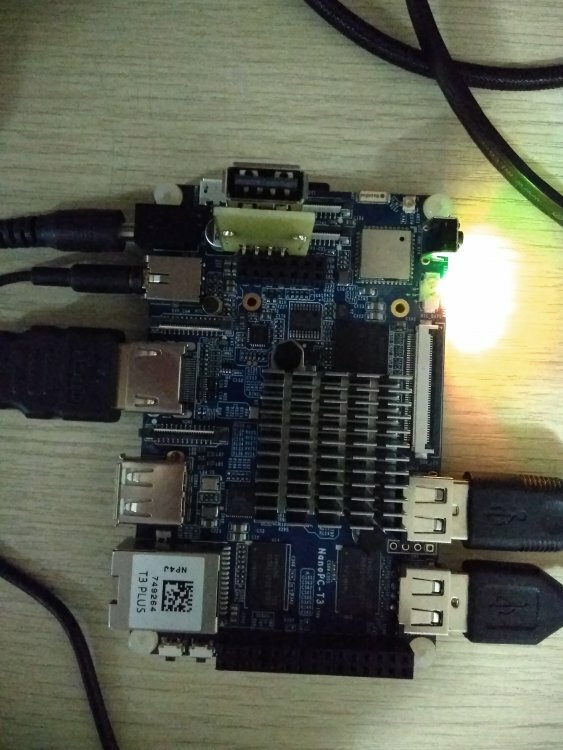 When i press boot button on my Nanopi T3 ( without plus ) nothing is happens. You need to hold the button and power on. You should see bootloader welcome but then it takes some time to see something(login prompt) on the screen ... T3 without plus was confirmed working a few days ago. Also, install to eMMC. I hold boot button 3-4 minutes. No bootloader welcome screen. Only black monitor. 1. You need to hold boot button, power the board and then you can immediately release the button. Bootloader show logo for about 1 second. If your monitor is not fast enough you can easily miss it. 2. Then you need to wait a few minutes that SD card is resized. I can't tell exactly how long ... my 32GB Samsung EVO needs almost 3minutes to resize. There is nothing on the screen in that time ... yes, this we need to change. 3. Images are tested and they 100% work. Have you try to boot more than once & from different SD cards?